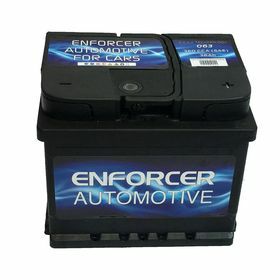 Enforcer Car Battery 063 38Ah 360CCA |County Battery. Free next day delivery on all Car Batteries. This great value Heavy Duty Enforcer Starter Battery utilises some of the latest technology and gives a 2-year guarantee. The Enforcer range of starter batteries is quality assured, giving that extra piece of mind. 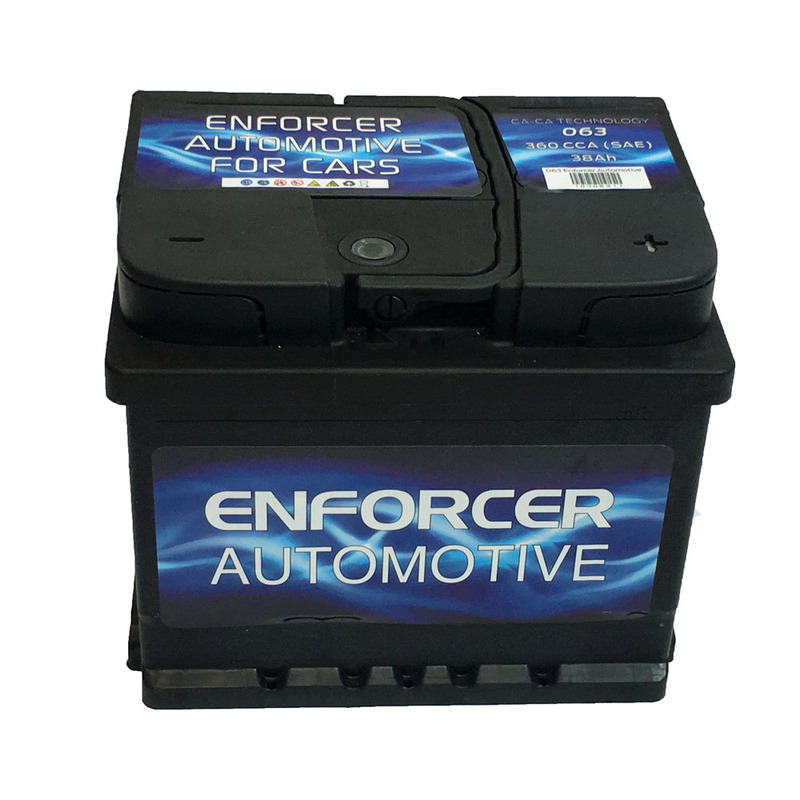 This Enforcer 063 Car Battery is used in many car types such as Alfa Romeo, Vauxhall Corsa, Volkswagen, Ford Fiesta, Renault Clio, Citroen and many more. Click on the Car Fitment tab on this page to find your car fitment. Enforcer 063 Car battery is suitable to perform for 1.0 litre to 2.0 litre petrol vehicles. Enforcer 063 Battery is a very high performing car battery range which is designed to produce power for the most demanding situation. Enforcer 063 battery is able to withstand the pressures of day to day use and has maximum power for starting and for the vehicle systems. Its construction combines full calcium technology for improved starting power, with the highest possible safety via the double lid. This battery lid ensures the acid is fully contained even if the battery is tipped up or rolls over. The Enforcer 063 offers optimised cold cranking values, robust cyclic capability and has very low maintenance. The Enforcer is perfect for when reliability is essential, crafted to power all types of vehicles from small to large. Great robust battery with very less maintenance. Worked well on my car. Will shop again with County Battery. Excellent service fast delivery thank you very much. Quality Battery Supplier with great product. The battery fits my Audi great. Great Battery Supplier and great prompt service and the battery fits perfectly and is performing exceptionally. Will buy again! Ordered online and ready for collection when I got to the shop. Battery fits perfectly on my car and is performing well. Very happy with service received.